Though the volume of DDR postage stamps issued during 1954 was much smaller during 1953, they covered a wide range of contemporary subjects. Some of the new commemorative stamp issues for 1954 featured an important peace conference, the anniversary of the German Democratic Republic, and a new souvenir sheet for an important German philatelic exhibition. The customary annual stamps for youth activities, commercial fairs, and sporting events continued to be issued, as well. The 20 Pf. denomination stamp shown above, at the left (Mi. #423, Sc. #205), was issued on January 20, 1954 to commemorate the 225th Anniversary of the Birth of Gotthold Ephraim Lessing (1729-1781), the noted German philosopher and writer. The 20 Pf. denomination stamp shown above, at the right (Mi. #425, Sc. #207), was issued on March 5, 1954 to commemorate the 1st Anniversary of the Death of Joseph Stalin (1879-1953). The two DDR stamps shown above (Mi. #426-27, Sc. #208-09) were issued on April 30, 1954 to publicize the Warsaw-Berlin-Prague 7th International Bicycle Peace Race. 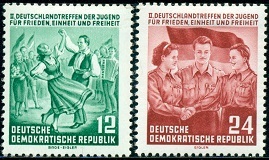 The two DDR stamps shown above (Mi. #428-29, Sc. #210-11) were issued on June 3, 1954 to publicize the 2nd German Youth Meeting for Peace, Unity, and Freedom. The two designs feature dancers and a boy, two girls, and a flag. The 24 Pf. denomination stamp shown above, at the left (Mi. #430, Sc. #212), was issued on July 12, 1954 to commemorate the 80th Anniversary of the Death of Fritz Reuter (1810-1874), a noted German writer. The 24 Pf. denomination stamp shown above, at the right (Mi. #432, Sc. #213), was issued on August 18, 1954 to commemorate the 10th Anniversary of the Death of Ernst Thälmann (1886-1944), the German Communist political leader. The two pictorial stamps shown above (Mi. #433-34, Sc. #214-15) were issued on September 4, 1954 to publicize the Leipzig (Fall) Fair. The designs feature the Hall of Commerce at the Leipzig Fair. The two stamps shown above (Mi. #443-44, Sc. #224-25) were issued on October 6, 1954 to celebrate the 5th Anniversary of the German Democratic Republic. The 20 Pf. denomination stamp shown above (Mi. #445A, Sc. #226) was issued on October 23, 1954 for Stamp Day. The design features Cologne Cathedral, the Leipzig Monument, and an unissued type definitive postage stamp. The souvenir sheet shown above (Mi. #445B (Block 10), Sc. 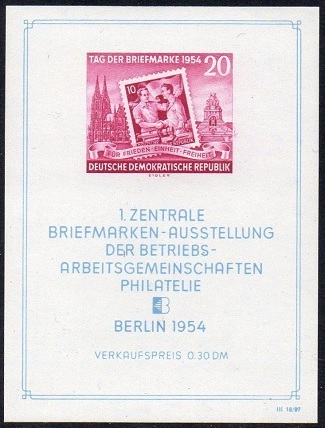 #226a), containing an imperforate example of the 1954 Stamp Day Issue, was issued on October 30, 1954 for the First Central Philatelic Exhibition of Labor Unions in Berlin. This souvenir sheet exists with horizontal and vertical watermarks. The sheet with the vertical watermark is very scarce. The 12 Pf. denomination stamp shown above (Mi. #424, Sc. #206) was issued on January 25, 1954 to publicize the Four Power Conference in Berlin. The major topics discussed were the final post-war international status of Austria and Germany and the conclusion of the Korean War. The 24 Pf. + 6 Pf. denomination stamp shown above (Mi. #431, Sc. #B26) was issued on August 16, 1954 to benefit Flood Victims.